Based on a novel by Yasushi Akimoto, Miike brings in a cinema friendly horror film that owes quite a debt to Ringu. Yumi (Kou Shibasaki) is at a party in an Izakaya when a friend named Yoko (Anna Nagata) gets a strange voice message on her cell phone. The message is dated two days in the future and from her own phon. The message contains the Yoko’s voice as she complains about rain then suddenly screams. Yumi is spooked. A friend named Kenji (Atsushi Ida) offers to take the party to a hotel his parents own so the group swap phone numbers. Two days later Yoko dies. Yumi wonders if the mysterious call had anything to do with it and when discussing events with Kenji she discovers Kenji got a similar mysterious message. Yumi is now in a race against time to stop the death-messaging call. Far more accessible and audience friendly than Audition One Missed Call is like Ringu in that it hinges on haunted technology as ghosts use modern everyday items to torment people. In this film victims receive mobile phone messages from the future that predict their death. Cue a set of gloriously inventive and blackly humorous death scenes as characters get bumped off in a series of unexpected ways. I have a confession to make: I have not watched Revolutionary Girl Utena all the way through. I have watched AMV’s, parts of the movie and parts of the television series but I have never watched them all of the way through despite knowing that it is one of the most critically lauded and beloved titles ever. The director of that is Kunihiko Ikuhara who also directed episodes of Sailor Moon something else I have never watched all the way through – primarily because it’s a girls show. Up until recently it seemed that Kunihiko and I just weren’t fated to get along. One clip from Mawaru Penguindrum changed that. Three siblings, twin-brothers Kanba and Shouma, and their terminally-ill sister Himari Takakura live together at home without their parents. Kanba and Shouma dote on Himari as any day could be her last. One day, when the siblings are out on a trip to the aquarium, Himari collapses. Taken to hospital it seems that Himari is finished but a miracle occurs when a spirit in a penguin-shaped hat revives her but in exchange for keeping Himari alive the spirit asks the Takakura brothers to acquire an item named the Penguin Drum which is in the possession of a girl named Ringo. Their only help is a trio of penguins that only they can see. Third Window Films delivered a devastatingly brilliant one-two of news with the announcement that they have acquired Sion Sono’s Himizu and Yuya Ishii’s Mitsuko Delivers. I have been following Himizu for a while now and I am a recent convert to the school of Yuya Ishii’s humanistic comedies after watching Sawako Decides a witty and charming satire of modern Japanese society so let me put out what is known about the films so far. I only heard about this when I did a little coverage of the BFI London Film Festival where the film was playing. It stars Ryo Ishibashi, a familiar face from many Miike Takashi works including Audition, as well as Takeshi Kitano films like the brilliant Kids Return and Brother. I’m familiar with the lead actress through her work in the anime Summer Wars and The Girl Who Leapt Through Time Aoi Nakamura was one of the actors in the Third Window Films release Quirky Guys and Gals. Mitsuko (Riisa Naka) is a young woman who is nine-months pregnant, broke and alone in Tokyo. Her parents think that she’s in America with her boyfriend but she’s actually in dire straits as she is forced to move out of her apartment and yet she remains positive and believes that things will turn out alright. She doesn’t know where she will go but decides to revisit her past including a boy who had a crush on her (Aoi Nakamura). The classic anime, Nadia: The Secret of Blue Water is getting a blu-ray box set release on the 23rd of November in Japan. That’s today. Unfortunately I doubt anybody is going to get this for me and I must resist the temptation to buy it myself because Christmas is a season where others must be put first and all that jazz. 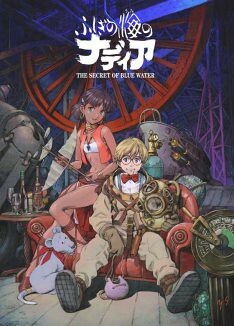 Well the story of the anime is based on the works of French fantasy and sci-fi author Jules Verne and follows a young French inventor named Jean and a former circus performer named Nadia, a girl of mysterious origins who wishes to return home. The two are chased by a trio of jewel thieves but are rescued by Captain Nemo and his submarine before an even larger enemy emerges. Sounds intriguing. Even more impressive is the list of people involved in the production of this anime. The series originally started as a concept that the legendary Hayao Miyazaki came up with for Toho but was never produced. Toho retained the rights to the story and commissioned studio Gainax to produce an educational series for NHK. Now Gainax are guys who strive to be original and never do the obvious, just look at some of the titles to come out of the studio: Royal Space Force: The Wings of Honneamise, FLCL, His and Her Circumstances, Gunbuster and Evangelion. Well the Gainax staff loved the concept that Miyazaki created and with Hideaki Anno (director of Evangelion for one thing) acting as director and Yoshiyuki Sadamoto as character designer they took on the task of animating the show which ran for 39 episodes from 1990 to 1991. This new release contains 7 blu-ray discs with all 39 episodes spanning 135 minutes plus a 111 page booklet filled with 74 pages Illustrations. The box illustrations have been drawn by Yoshiyuki Sadamoto who I’m a big fan of and I highly recommend Der Mond which is a book that collects his works. If I am honest I do not need this release. What I really want it for is the nostalgia. The blu-ray set looks incredible and I would love to have it in my collection, Sadamoto’s illustrations taking pride of place amidst the other anime collections but it is hardly life or death. The anime is probably floating around out there online since nobody on this side of the globe owns the rights to it but whenever I see the opening theme I’m reminded of the sheer exuberance of anime and the joy it once filled me with as a carefree kid. I mean… can you resist the intro? No healthy European childhood is complete without the adventures of the young globe-trotting journalist Tintin and his dog Snowy. I own a few of his comic book adventures and still remember so many details from them. As a kid (and even now) I find the stories are so much more interesting and humorous than anything most American comics produce so a new 3D CGI film from one of America’s greatest directors is an interesting prospect. As a fan I could not miss this. Young journalist Tintin (Jamie Bell) buys a model of a 17th Century ship named the Unicorn, the source of fantastic legends. Hidden inside the ship is a clue to a great mystery involving a lost fortune and pirates. Also on the trail of the treasure is Ivan Ivanovitch Sakharine (Daniel Craig), a model ship collector with dark secrets. Tintin and his faithful dog, Snowy, embark on a quest that unites him with drunken seadog Captain Haddock (Andy Serkis) whose ancestor Sir Francis Haddock was Captain of the Unicorn and with help from the Thompson twins (Simon Pegg and Nick Frost) they unravel a historical globe-spanning mystery. No change at the top of the Japanese box-office apart from number three which is Moneyball instead of The Three Musketeers. Japan adores baseball so I guess it’s no surprise. Better news has emerged with the return of Indiemoviesonline. The site went down earlier this year because of disagreements with sponsors but it is back and has a nice selection of Japanese films… I already own half on DVD but that’s okay. Back to the trailers! Ouran High School Host Club – Friday Break, is a live-action adaptation of TBS’s television series which is an adaptation of Bisco Hatori’s romantic comedy manga Ouran High School Host Club which I have never read the manga or watched the anime but understand that it is quite popular. Very, very popular. The trailer looks underwhelming. Ouran High School Host Club follows a girl named Haruhi Fujioka who attends a wealthy school. One day she damages a vase and so disguises herself as a boy to join the host club and pay off the damage. The film stars Haruna Kawaguchi who, in her feature film debut, reprises her role as Haruhi Fujioka, Mariko Shinoda of J-pop super-group AKB48. 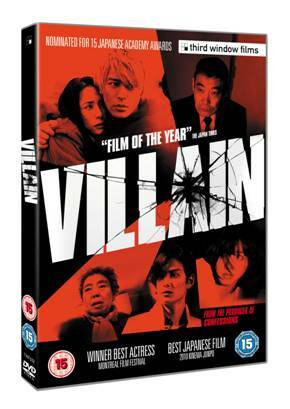 Third Window Films has announced the DVD release date of the multi-award winning Japanese film Villain. Eri Fukatsu: one of Japan’s best actresses and the lead in the current number one film in the Japanese box office, Once in a Blue Moon. For her performance in Villain she won the Best Actress at the Montreal Film Festival. Masafumi Kobayashi is a TV journalist who has been chronicling supernatural phenomenom since 1995. 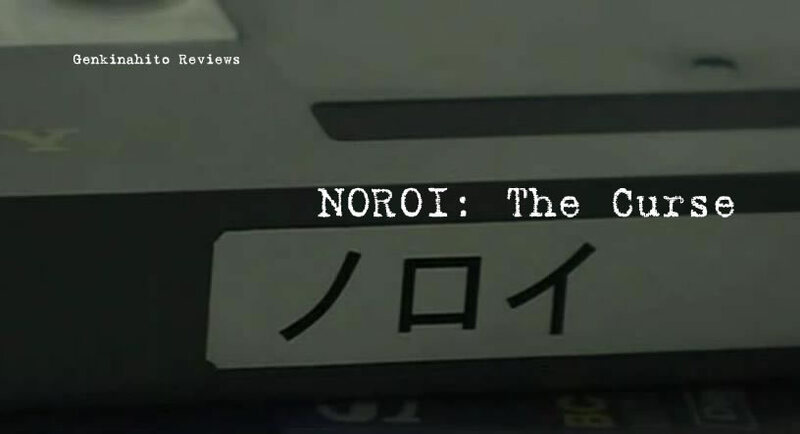 At first he is investigating a mysterious case of disembodied voices surrounding a woman named Junko Ishii (Maria Takagi) and her son but he soon gets involved in a number of cases that are seemingly unrelated. One is of a young girl named Kana Yano (Rio Kanno) who has amazing psychic powers and another concerns the celebrity Marika Matsumoto who has encountered a ghost. At first they seem to be separate but it soon becomes clear that they are linked by a 200 year old curse. Based on a novel by Yukiya Shoji, this lyrical depiction of isolation, jealousy and lust follows the fortunes of a college student, Koji, whose life is transformed when he is approached by a married man to spy on his wife. Played with wide-eyed enthusiasm by rising star Haruma Miura, Koji’s journey is peppered with wonderfully eccentric characters and the visual flair for which director Aoyama is renowned. Winner of the Golden Leopard at Locarno Film Festival. Four trailers this week – two for the films occupying first and second in the Japanese box-office chart and one for a Japanese film due out some time this year. The fourth is for Guy Maddin’s latest. This is currently reigning supreme for a second week at the top of the chart in Japan. It stars Eri Fukatsu who was excellent in the award-winning drama Villain and two of Japan’s coolest actors, Hiroshi Abe and Tadanobu Asano who both appeared in Survive Style 5+. This legal drama/comedy revolves around Emi Hosho (Fukatsu) who is a lawyer representing a client accused of murdering his wealthy wife. He claims that he didn’t do it. His alibi? While staying in an inn he suddenly suffered sleep paralysyis. Checking out his story, Emi also suffers the same thing and discovers it is down to the ghost of a Sengoku era military commander named Rokubei Sarashina (Toshiyuki Nishida). Now all Emi has to do is get the ghost to testify in court! YUREI!!!! Ahem. Sorry. The trailer looks like fun.